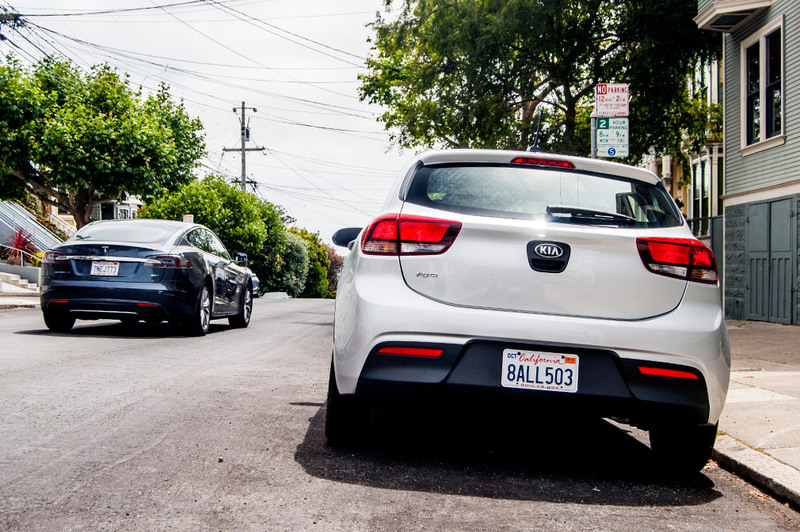 Entry-level car buyers have a few distinct flavors from which to choose, and Kia’s Rio hatchback is the one that feels the most low-slung. 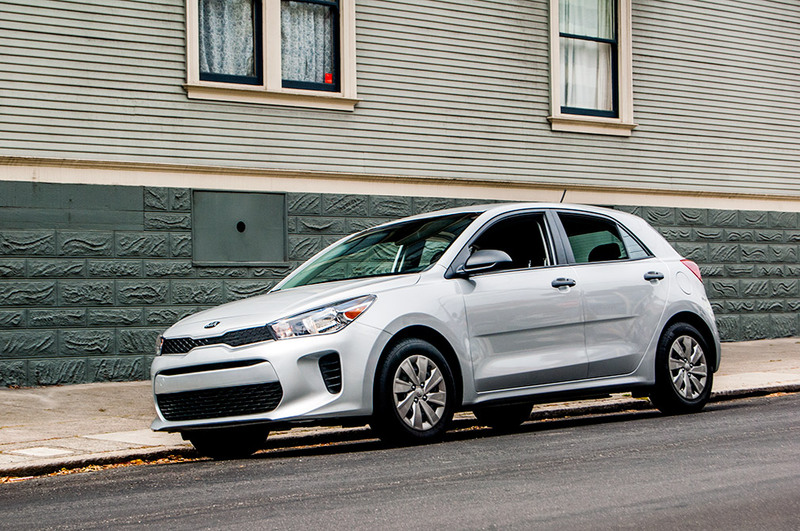 The Kia Rio and others in the budget class are the entry point for many drivers entering the new-car market. They’re just big enough to do most of the things larger cars and crossovers do, and they’re typically styled on the anonymous side, with the emphasis on functional transportation. 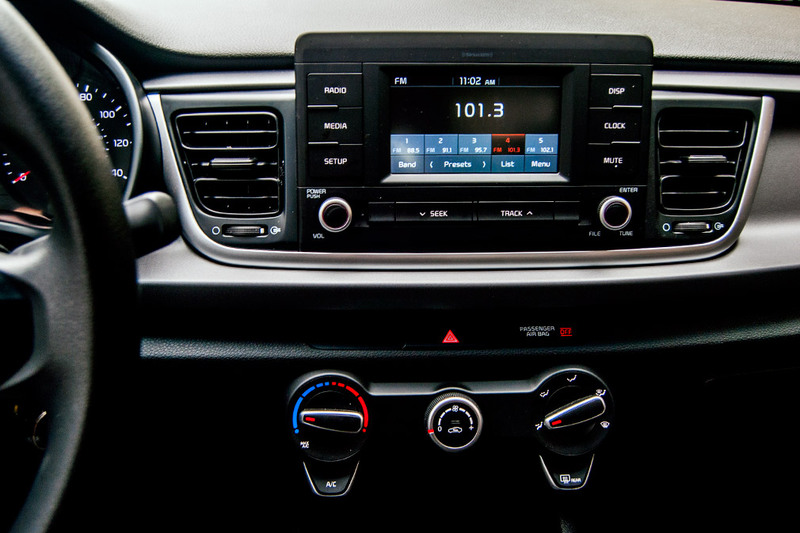 Looking for a new or used Kia Rio? Check out BestRide’s listings search here. Claiming a Rio of your own became more expensive for 2019. The $14,200 2018 Rio LX examined here was eliminated for ’19, leaving the $16,400 S as the only hatchback trim left. 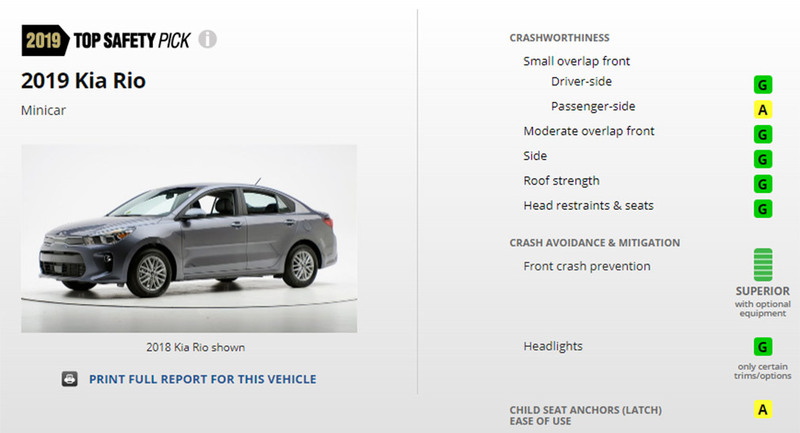 The Rio sedan retains the LX at $15,300 and the S at $16,100. Our 2018 Rio LX tester added the $1,090 automatic transmission, the $300 LX Convenience Package (includes rear camera display, Bluetooth® wireless technology, overhead sunglasses holder, dual map lights), and the $895 destination charge for a $16,485 total. The Rio pretty much aced its Insurance Institute of Highway Safety (IIHS) tests, and it qualifies as a 2019 Top Safety Pick. While the lowest price of the Rio has risen with the elimination of the LX series, the price of active safety has decreased with the axing of 2018’s EX trim. 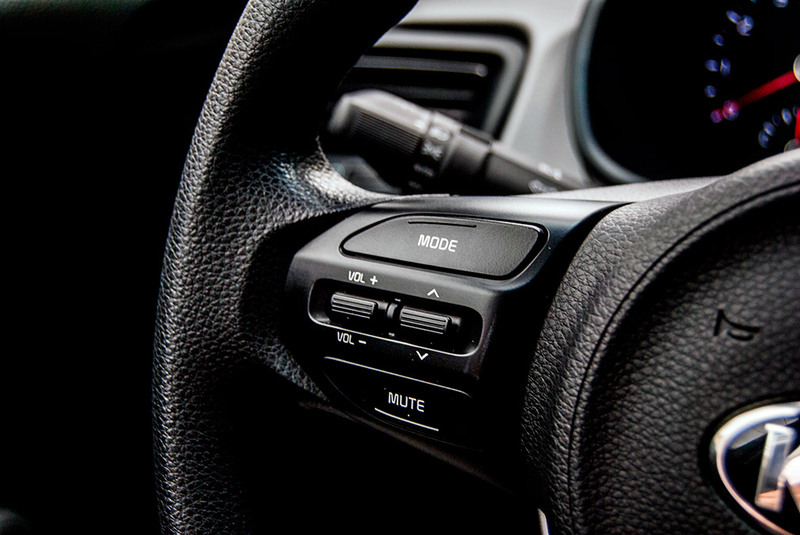 To get collision-avoidance assistance, you’d have to pony up the well-equipped EX’s $18,700 price, which follows the previous trend of pairing safety items with luxury features. For 2019, you’d add the $800 S Technology package to the $16,400 base price for a $17,200 price for a Rio with active safety. 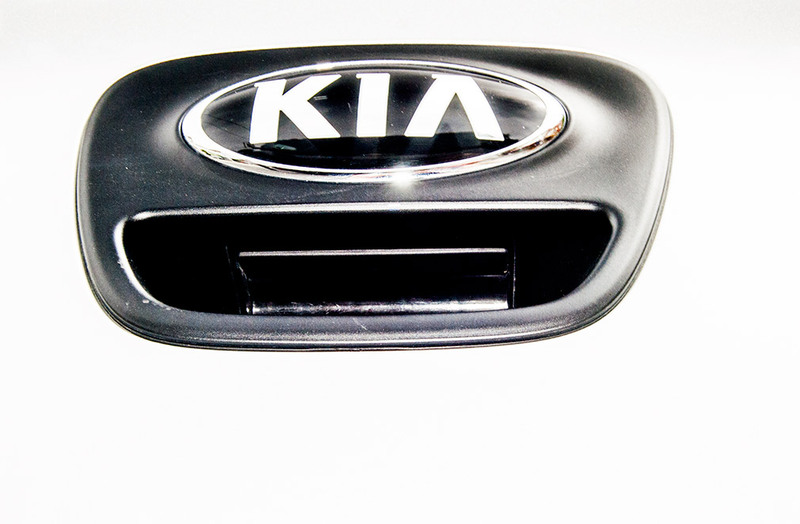 That’s $1,500 less than last year, and we applaud Kia for making these important driving aids more affordable. 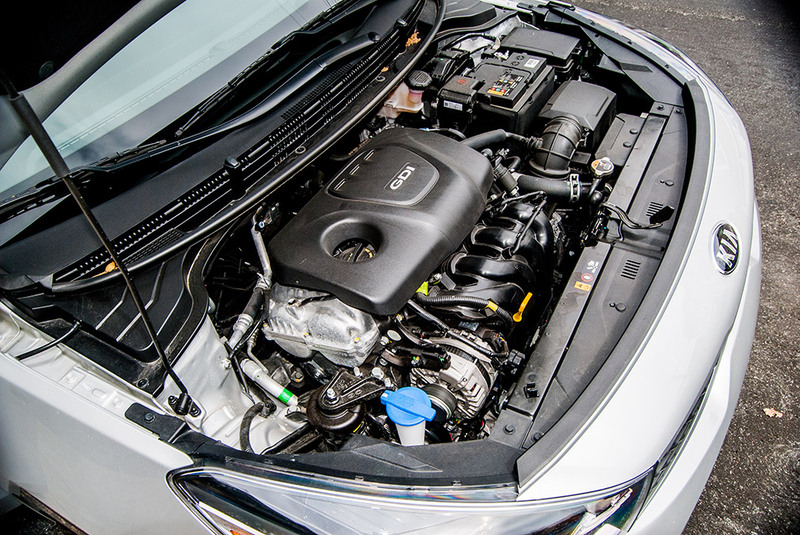 The Rio’s four-cylinder engine is about what you’d expect, with its 1.6-liter displacement producing an adequate 130 horsepower. It’s noisy when revved near its 6,300-rpm redline, but there’s not much need for that, as there’s ample power for keeping up with traffic. 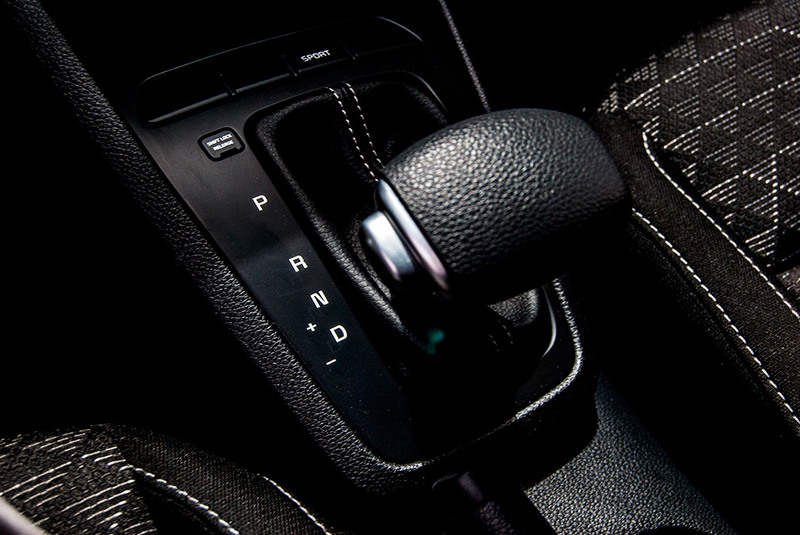 The Rio’s six-speed automatic – manuals are gone from the 2019 model, *sigh* – functions well enough in holding the engine in the torque curve’s prime parts. 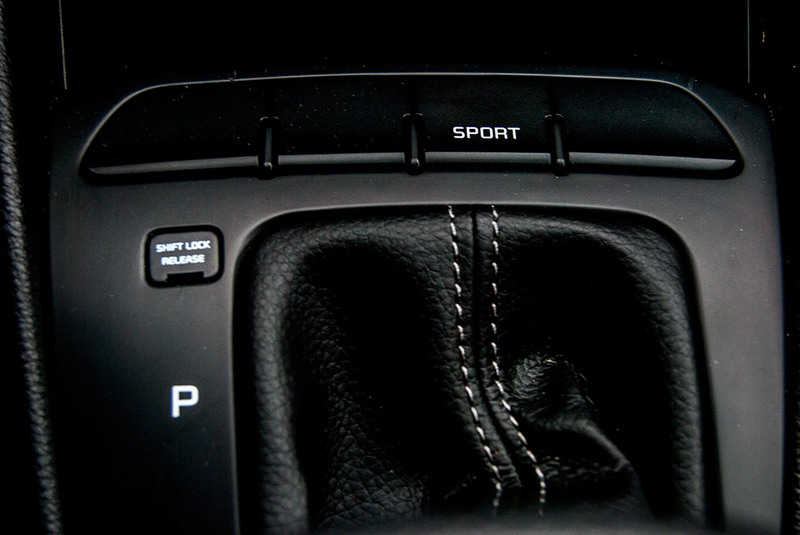 Sport mode is a welcome addition in keeping the shifts brisk. 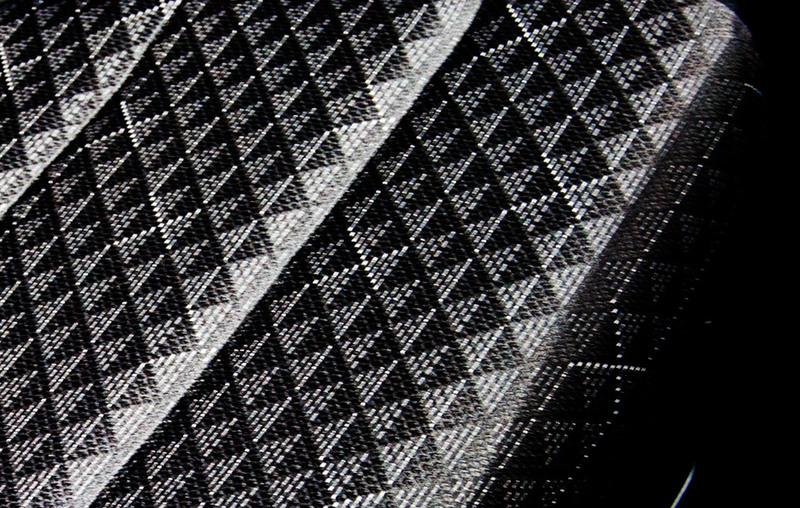 Discussion of the Rio’s roadability begins with its low-slung architecture. The Rio is lower and wider than its competitors – not by much more than an inch in either direction – but small differences can mean a lot in small cars. And so rather than feeling like you’re up in a chair as in a Ford Fiesta, you’ll seem instead to be stepping down into the Rio’s interior. This is backed by a track (the distance between the wheels) that’s two inches wider than the Fiesta‘s, front and rear. 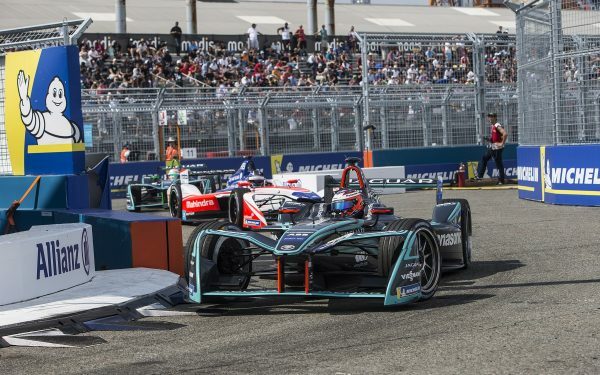 So you’re sitting low on a wide-set chassis – sounds like the ingredients for something sporty, eh? 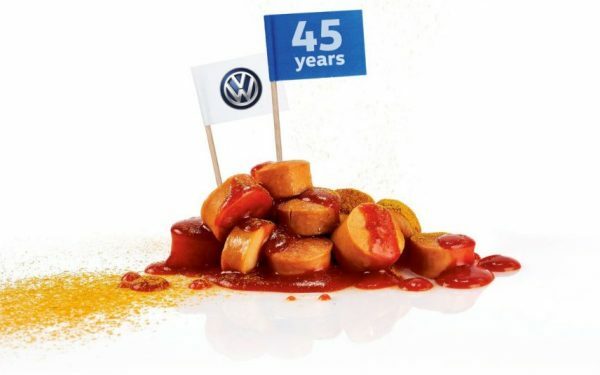 It’s a promising setup, but the mainstream-minded underpinnings skew toward comfort, so there’s not much driver engagement. 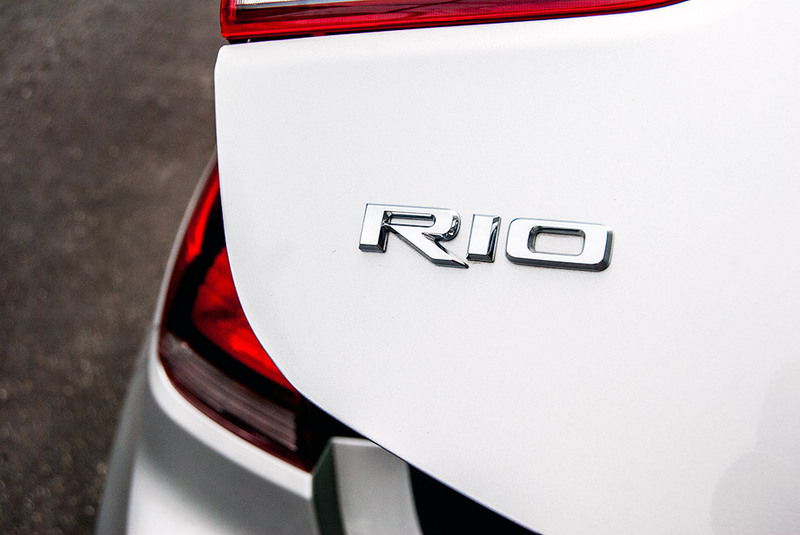 But, the Rio is as smooth and relaxed as you can imagine a small hatchback being, and that’s what most Rio buyers will want. 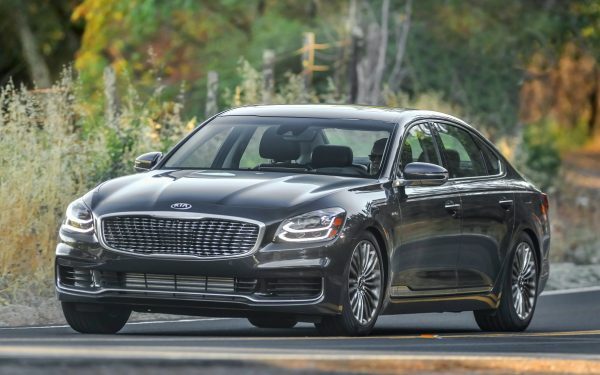 One note on the low driving position: even if you’re taller than six feet, you’ll likely spend a lot of time looking through the lower portion of the windshield, which in our tester had considerable distortion toward its base. 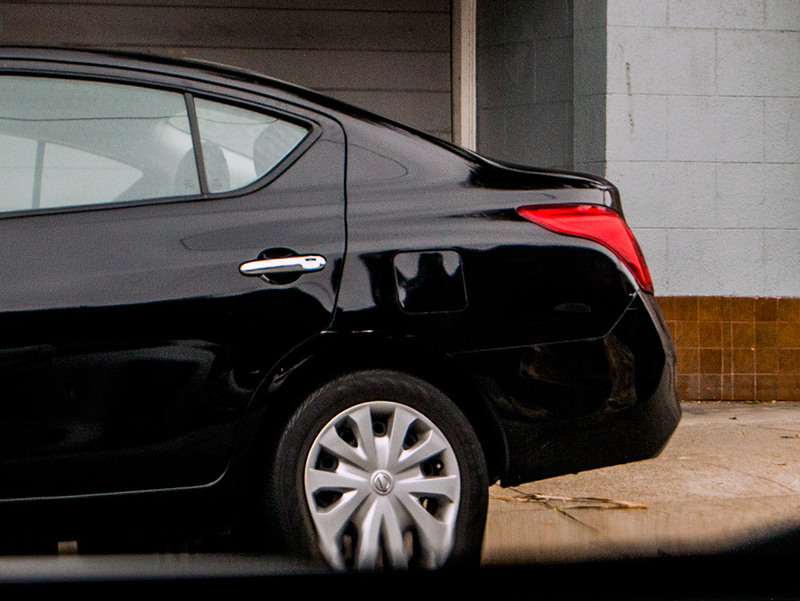 The melting wheel cover of a Nissan Versa as viewed from behind the Rio’s wheel illustrates this. 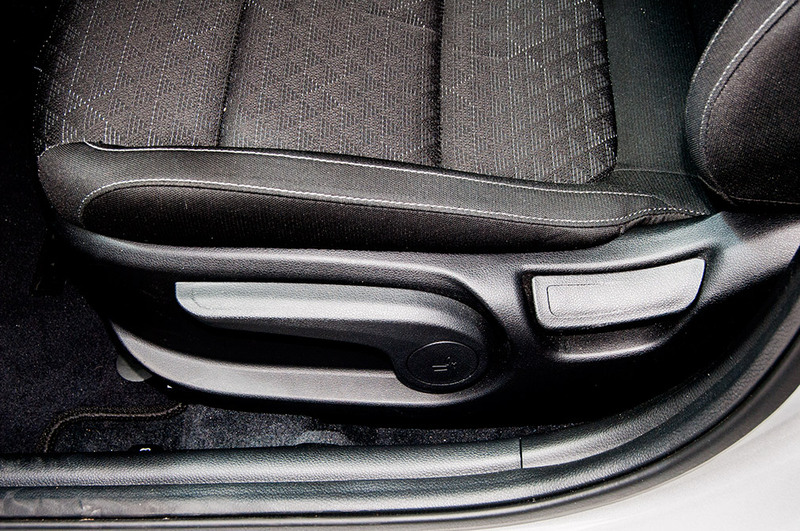 The Rio LX’s front seats are broad and firmly padded. There’s a height adjustment for the driver’s lower cushion. Taller drivers will still wish for more thigh support, but there’s enough flexibility for most people to find an agreeable position. 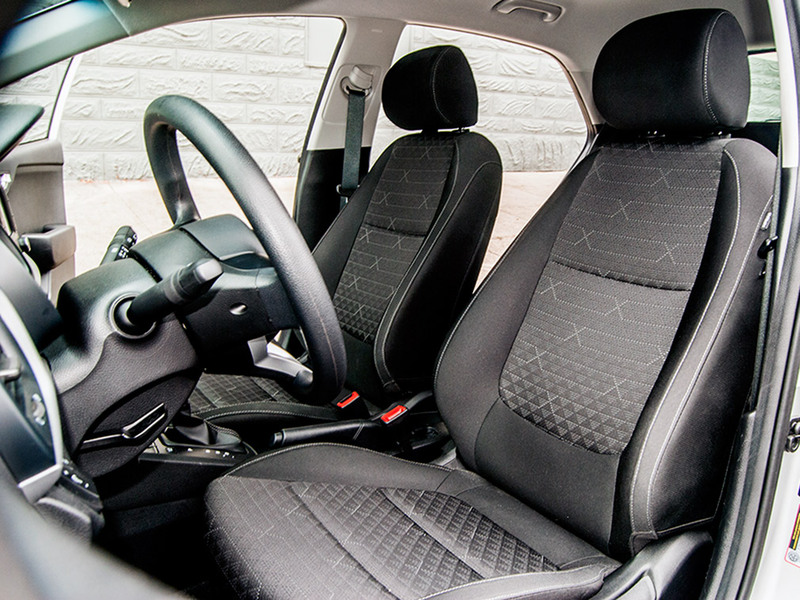 The Rio LX’s upholstery and light-colored stitching provided welcome relief from the interior’s volumes of black plastic. 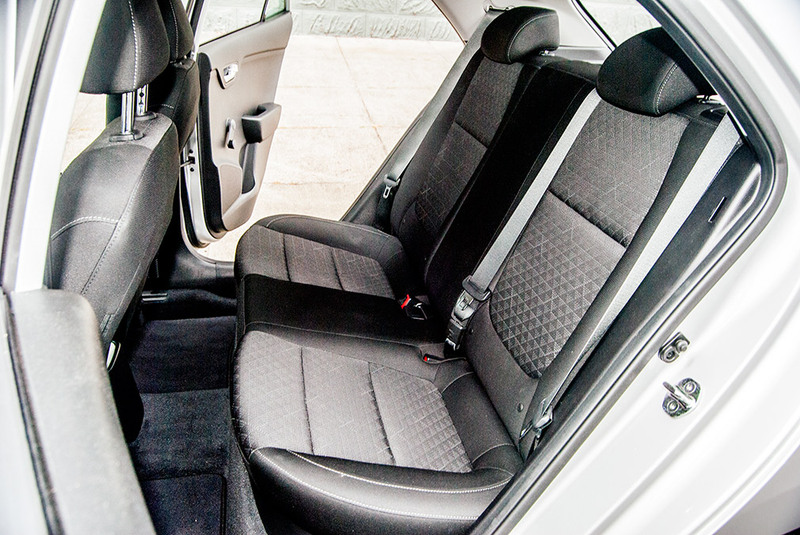 Rear seats in the Rio LX hatchback are typical of this class, with 33.5 inches of legroom pressing tall rider’s knees into the front backrests, but riders with a height less than 5’11” should be content. 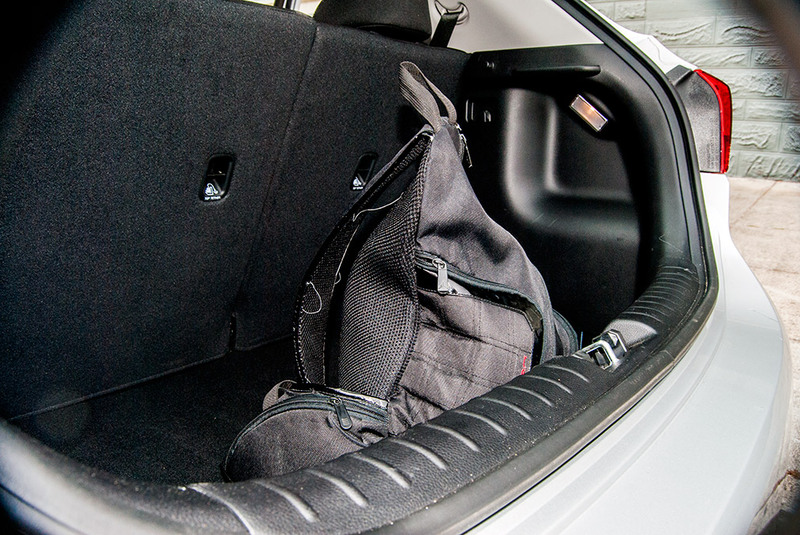 The Rio hatchback’s cargo area is impressively ample, with more than 17 cubic feet available for your loot. 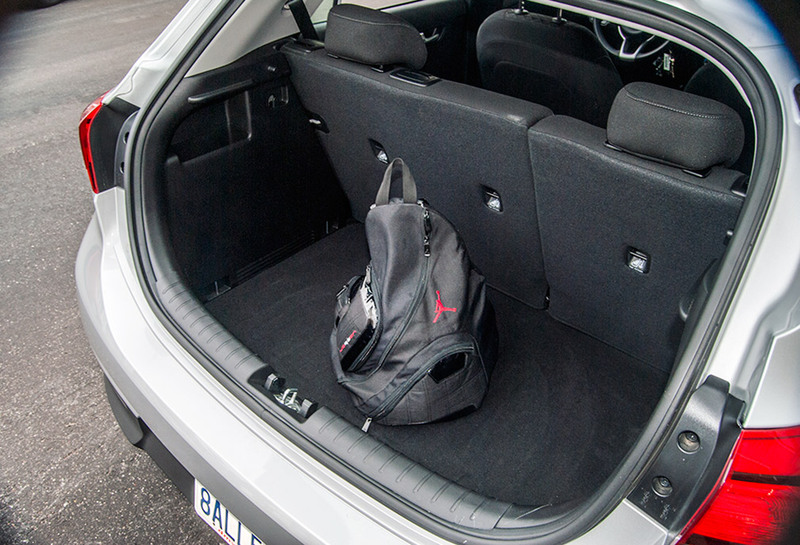 In continuing the Rio’s low-slung theme, the trunk floor sits lower than the loading ledge, so you’ll be doing some lifting in and out. 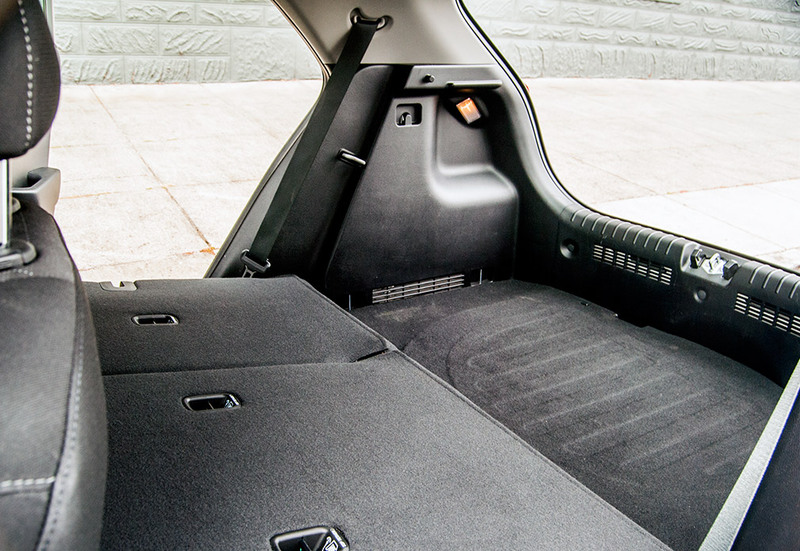 The rear seats fold into a raised platform adjacent the cargo floor. 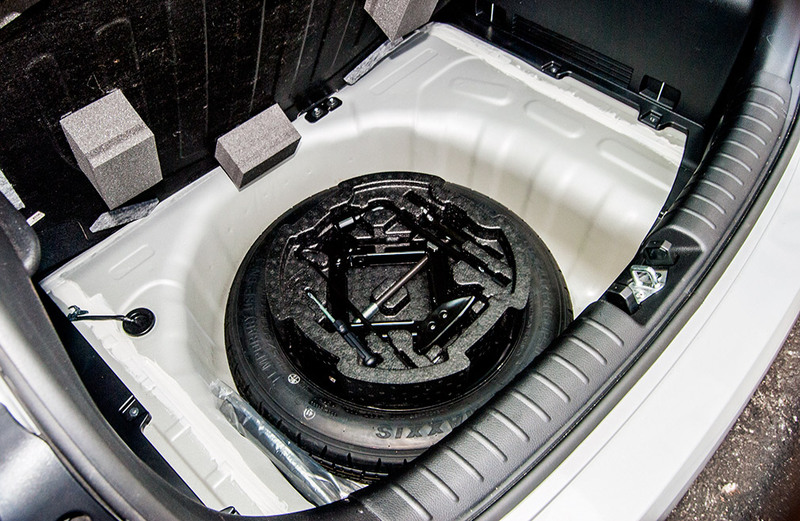 Under the floor is a spare tire with room for smaller items. The tested Rio’s five-inch screen is relatively small in size but still functions like the big boys, with crisp graphics and responsive engagement. Its simplicity can be a relief when compared to more complicated systems that seem to bristle with selections. Steering-wheel controls are a nice touch at this price. 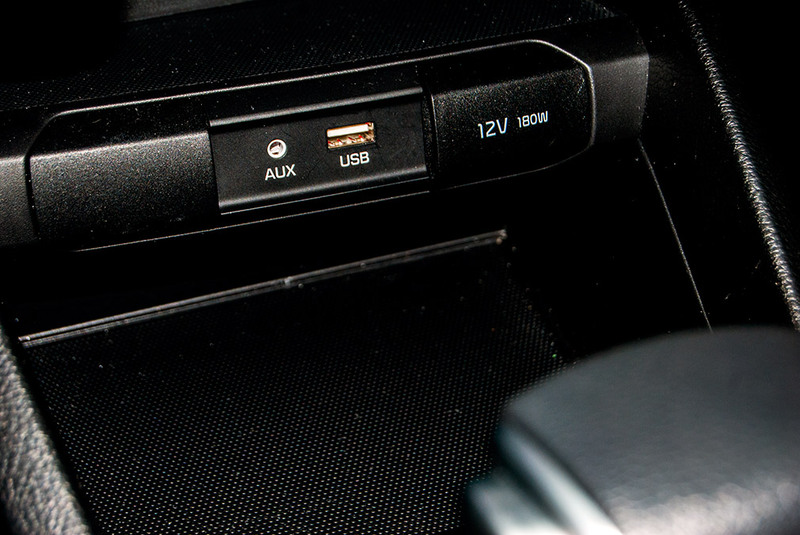 Just the basics with connections, one of each (aux, USB and 12V power point) to meet your and your passengers’ needs. 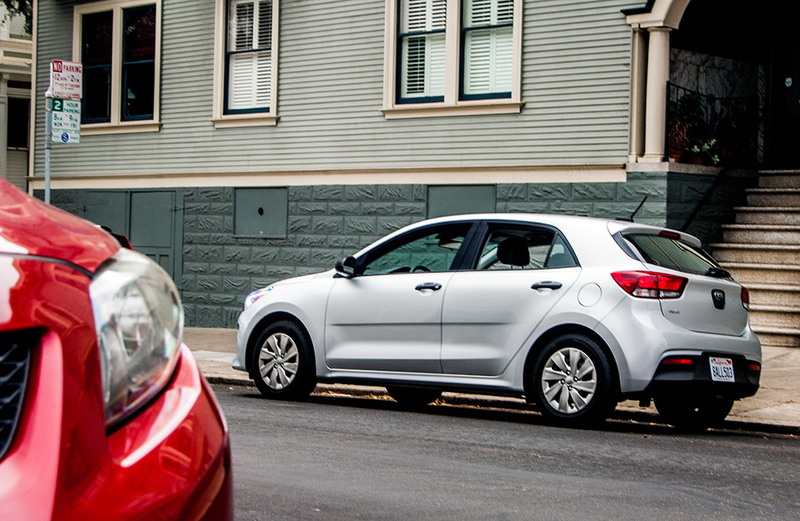 The Kia Rio is budget car that manages to feel larger and more substantial than it is, thanks to its low and wide design. The tested Rio LX hatchback would fold right into the typical commuting and errand-running most cars do. 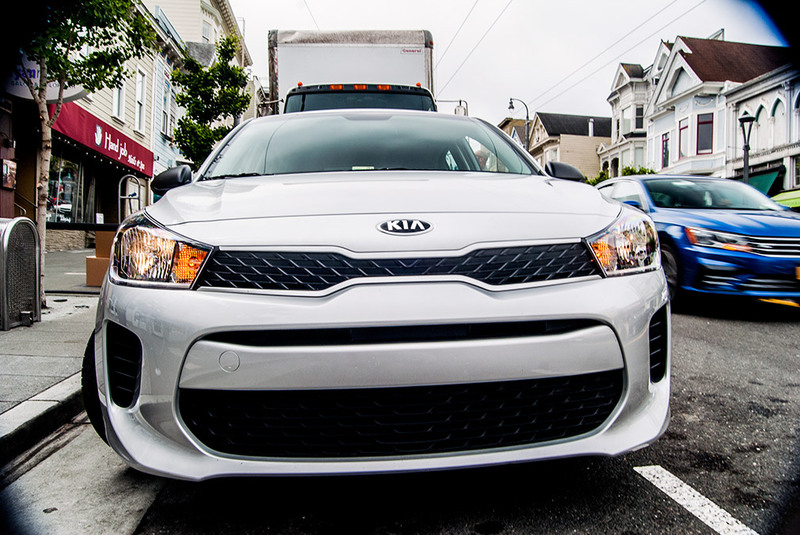 The Rio hatchback’s biggest competitor actually seems to sit in the same Kia showroom – now that the bottom-priced Rio LX hatchback has been eliminated, the Rio S hatchback’s starting price aligns almost exactly with the Kia Soul’s. The Soul’s tall-boy shape sharply differs from the low Rio’s, giving entry-level Kia buyers a clear choice between the two.